In the present world of websites and applications, PHP is used as a primary language for web development. The use of PHP language in India has surged in the recent past. In this article, we have listed some important reasons for forming your career in PHP. Let’s see why choose PHP Developer as a career and the future scope of PHP development. PHP platform is widely used as a tool in web development. Websites with great names, such as Facebook, Yahoo, Myspace, Wikipedia and Digg run on PHP. For aspiring web developers, PHP would be very promising. Websites with different domains, including, e-commerce, CMS and CRM are structured in PHP. PHP is employed mostly in all business domains. Learning PHP comes with an easy sail as it’s syntax resembles Java, C, and Perl. The Internet has ample of resources to explore about PHP. There are several realistic examples that demonstrate the functions of PHP. PHP is a 100% open source application that is free. As a PHP Developer, you can delve into numerous open source softwares such as MySql, Apache and Linux system. PHP frameworks are also free of cost. Joomla, Magento, and WordPress are examples of platforms that use Object Oriented Programming Language. Enterprise systems employ concepts such as inheritance, encapsulation, and polymorphism. The OOPS programming concept was introduced by PHP5. Your C++ and Java qualifications will make you comfortable when using PHP as an OOPS. PHP’s main advantage is its frameworks. Zend, Symfony, CakePHP, Akelos, CodeIgniter, and Laravel are some of the most popular PHP frameworks. Use of frameworks has many positive points. First, the re-use of codes accelerates growth. Secondly, the use of proven and tested codes reduce errors. PHP enables Compiler-based Applications. Magento deploys this concept. Applications built in other languages can also be aligned with the PHP ecosystem. For example, with the help of C language, many extensions in PHP were built. PHP contains many applications such as MySql, HTML, and JS. PHP is UNIX, Linux, Windows and Mac compatible. It also collocates well with MySql and Apache. Cross-platform development is viable with PHP. On a whole ranking, PHP is a cost-effective programming language. Apart from providing security, PHP can be scaled easily and is encrypted. There is an automatic renewal in websites and applications. PHP enables the options of self-customization by users according to their liking. Being a free product, the code can be written by any editor. With PHP, it is also feasible to bring about special effects and graphics design. Therefore, PHP has got multifaceted and liberal aspect to its functioning. PHP has got multi-tools, be it for frameworks, certification courses, publishers or reliance supervisors. Online documentation is available for a whole range of PHP programming. With access to scores of extensions, the end results can be customized as per the needs of the clients. With the customization advantage of PHP, it is the highly desired framework of development for CMS. PHP-based sites perform faster. PHP can be lodged on to HTML. Therefore, fixed width layouts become liquid layouts. There is an ever-increasing demand for PHP Developers with almost everything being re-written in codes. Thus, the job of a PHP Developer is that of a promising one. A degree in information technology or software engineering is a preferable prerequisite to work in the area of PHP. However, as an amateur, you can develop your skills in PHP without having a professional academic qualification if you are willing to work in a non-MNC company. As a fresher, a PHP Developer may not earn more but upon gaining experience gradually, one can reap high earnings. Adequate knowledge of PHP and fine managerial skills can fetch you the plum job of a PHP Project Manager. While being responsible for generating high incomes, a project manager can enjoy a plush life. 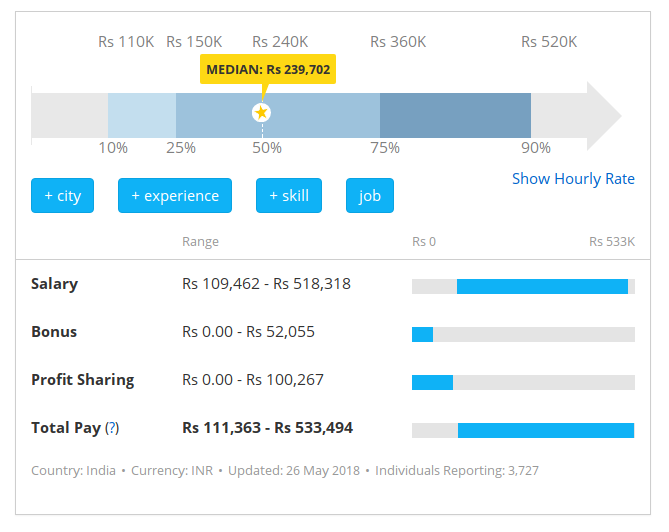 According to PayScale.com survey, the average pay for a PHP Developer is INR 243,983 per year in India. The skills that bring high earnings for this job are Drupal and Dynamic HTML (DHTML), Model-view-controller (MVC), jQuery, and MySQL. Besides this, experience in the job sorely influences the income. Knowledge of other web technologies like AngularJS, Joomla, Magento can fetch a person good salary in any other country or city. PHP is a popular web programming language employed all over the world. Moreover, it has been adopted by millions of contemporary websites. As per the findings of Latest Survey, PHP is utilized by 84% of the major web server. PHP Developers are amongst the most ardent professionals in the programming world. Almost, every MNC company in India hires PHP Developers every year. Therefore, the demand for skilled PHP Developers are going to rise in the coming years. Hence, these are the vital reasons to choose PHP Developer as your career. Whether you are starting out a career in PHP, or already working in PHP development, it has immense job opportunities and future scope with high salaries. Nice article regarding choose career as PHP developer. A theme like yours with a few simple adjustements would really make blog stand out. Please let me know where you got your design. Thanks a lot. Such a wonderful post please keep it post,, Thanks for this great information and list. Very nice article. Really helpful article. Every person should read this article till end. Future scope is one of the reason I choose PHP as IT career for me. Start with the freshers is little bit difficult and now its good to go with PHP development. topic of this website, this website is truly amazing. That is a really good tip particularly to those fresh to the blog. An outstanding share! I have just forwarded this article to a coworker who had been conducting a little research on PHP language. PHP is a very good Language and also it has lot of scope in future so without any confusion people can choose php developer as a career. Wow, great. You have listed the absolute reasons to choose PHP Developer as career, I like your blog. Great Grand Blog, Thanks a lot.